At first glance, a parent may eye a children’s book series with some cynicism. Aren’t these formulaic tomes written by authors just to make money? The literary equivalents to Rambo VIII? Not so! Take another look at some tremendous book series that offer both voracious and reluctant readers a reason to keep coming back to the library. 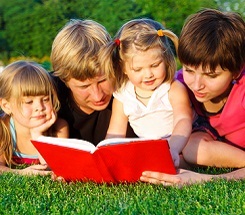 In addition, listening to a book series in the car is great way for families to experience the stories together. Here are a few favorites that both kids and adults will enjoy. Written by Irish former teacher, Eoin Colfer, this is a clever, funny series that spins the tale of Artemis, a brilliant criminal mastermind, who is 12 years old when the story begins. Combining the best of fantasy, science fiction and realistic growing-up angst, this series offers up high-tech fairy operatives that are so believable you may find yourself checking for evidence that fairies don’t exist. Artemis is an endearing anti-hero and the characters that travel through this action-packed story are equally likeable. The first book takes some warming up to, but by Chapter Three, both you and your kids will be hooked. The Ruin of Gorlan, The Burning Bridge, Icebound Land, Battle of Skandia, Sorcerer of the North, Seige of Macindaw, Erak’s Ransom, Kings of Clonmel, Halt’s Peril, The Emperor of Nihon-Ja. A mythical, medieval land is the setting for this series that chronicles the story of Will, an orphaned boy who becomes apprenticed to a ranger. Rangers are peace-keeping, highly trained operatives, experts in tracking, war strategy and the use of the long-bow. At first glance you are tempted to think this is a series for boys, but girls will love it too. The author, John Flanagan, is an Australian television writer. He initially wrote the story in order to encourage his son to read. This world is peopled with princesses, knights, diplomats, the occasional mythical creature and a great deal of intrigue. It is filled with fighting, and bad guys are killed, but it is also a story that highlights integrity, loyalty and courage. Unless you have lived on Mars for the past 12 years, you have certainly heard of the Harry Potter series. J.K. Rowling, the English author, revolutionized the book industry and hooked an entire generation on reading. Here’s why—these books are good. If there is a crime to the success of the series, it is that many kids will say, “I’ve seen the movies, I don’t need to read the books.” Don’t let that be your child! Harry, an 11 year-old orphan when the tale begins, learns that he is actually the child of wizards. Part of the charm of the book is the magical realism, the parallel world that Rowling has created. This is a series that grows up with a child. The books become darker and more sophisticated as Harry, Hermione and Ron grow into teenagers. It would be wonderful if you could encourage the reading of one book a year, the way the Potter generation of kids were able to read it, but your kids won’t want to stop. This is a powerful story about the evils of racism and the unique power of love. The Lightning Thief, The Sea of Monsters, The Titian’s Curse, the Battle of Labyrinth, The Last Olympian. Former teacher and prolific writer, American Rick Riordan brings the world of Greek mythology right to your back doorstep with this series about a young, modern-day teenager who learns that his father is really the Greek God, Poseidon. All Hades breaks loose while Percy learns to use his demi-god skills at a special camp. In a format very similar to Harry Potter (i.e.Joseph Campbell’s traditional hero quest cycle), Percy and his friends, Grover and Annabeth, set off on a hero’s quest to save the world from the Greek Gods’ wrath. The story entertains and makes Greek mythology approachable. This series has a squeal that introduces the Roman Gods into the mix. In addition, Riordan has written a series centered around Egyptian mythology. If you are familiar with the work of humorist Dave Barry, you can imagine the whimsical nature unleashed as he puts his pen to the co-writing of a children’s book series. This is a swashbuckler of a tale with pirates, treasure, dolphins who communicate with humans and a boy named Peter. Yes, that Peter. It is as if Barry and Pearson have taken the original story of Peter Pan and expanded the edges in order to tell the complete story as opposed to the abridged version of the play. Details are enriched and the plot begins to make sense as the empty shell of the original story is colored in for us. It is funny, fast-paced and poignant, especially when Peter learns that his encounter with stardust renders him unable to grow up. Like the others on this list, this is a series for the entire family with a Disney-like skill to entertain at many levels.